Hi all, just found this forum and was hoping that I might get a little help. I've started some tomato seeds that have been doing very well until the past few days when they started to wilt. I've done a little foliar feeding and some fertilizing with organic fertilizer tea but hey continue to look poor. If I post a couple of pictures might you be able to help me identify the problem? Yes indeed, pictures could help, along with some information on the varieties you planted, seed starting medium (soil/soil-less), when seeded... While there is no guarantee we can 100% identify the problem, it would certainly help to know those details. Ok, here goes. I started the seeds in peat pellets. Once they were about 2 - 3 inches high I put the peat pellets in the pots you see in the pictures. They are 3" peat pots I believe. These were started about 6 weeks ago and are about 8" high right now. The soil used for the potting is just some stuff I got at Home Depot - I'll attach a picture. It had a lot of wood in it and doesn't hold water very well. The bag says it has composted forest humus, compost, composted chicken manure, worm castings, kelp meal, bat guano and oyster and dolomite limes. 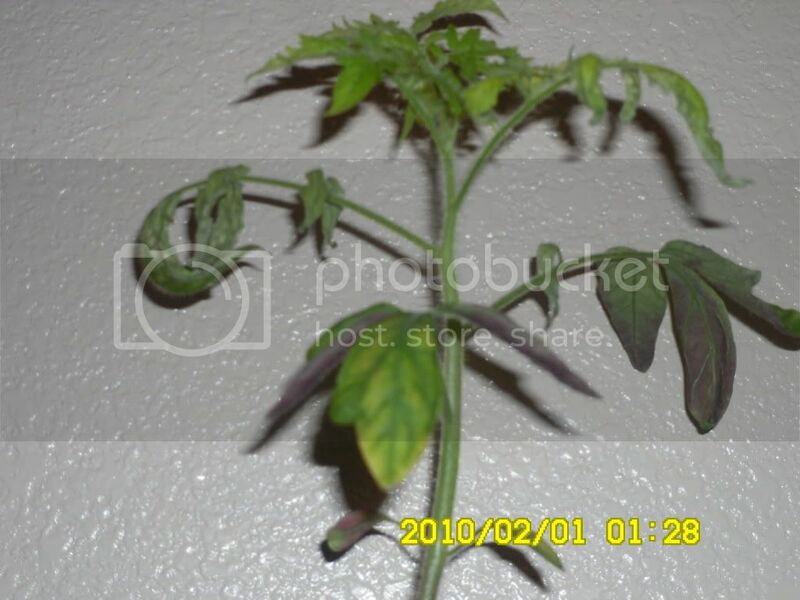 Here are a few pictures of the tomato plants which are a Big Boy Hybrid that is supposed to do well in the heat. That looks more like mulch than potting soil to me? I'm sure somebody will give you the low down better than I.
Hi Lupin, I'm couldn't make the photos very large when I opened them, so I couldn't quite make out if the leaves are curling up? When the plant has that purplish coloration, it could be a phosphorous deficiency. The leaves droop and curl under also. A few sources of phosphorus are bone meal, rock phosphate, and superphosphate. Curly top virus also produces that purple tinge to leaves...but the leaves curl up. That virus can be soil borne...and it doesn't bode well for your plants, I'm sorry to say. Hope your plants recuperate soon! I know, this is probably not what you wanted to hear, but at this stage - if these don't survive, it's not too late for the new ones to take off. Thanks for all of your responses. Sorry about the pictures - I'm anything but a photographer. The leaves were curling under. In the past two days since I fed them the tea they seem to be doing a little better but I will be planting some additional seeds just in case. I decided to put these tomatoes in the garden to see what happens - I have a greenhouse that stays above 50 degrees at night so they shouldn't get too cold. I have searched for and found some starting soil that should be much better. Time will tell! what is the best seed starting medium for tomato seeds?